After all of the noise, protests and controversy — much of it centered in Brooklyn — the long, drawn-out battle over speed cameras appears to be near an end. Under his plan, the number of speed cameras would increase to 290 from the current number of 140. In addition, new signage is planned to give drivers fair warning of the presence of the cameras. The number of cameras in each school zone would be determined by the city. State Sen. Andrew Gounardes (D-Bay Ridge-Southwest Brooklyn) said that while he is pleased to see an increase in the number of speed cameras on city streets, he wants to see even more cameras out there. “The governor’s proposal to add 290 speed cameras is a start, but we need to go further. The safety of our children should be paramount, and every school in New York City should be protected by speed cameras,” Gounardes told the Brooklyn Eagle on Tuesday. The original legislation paving the way for the pilot program for speed cameras was adopted in 2013. But the program had a five-year window, which expired on July 25, 2018. The state Legislature was on summer hiatus at the time. Prior to the end of the legislative session in June, the State Assembly approved a measure to extend the pilot program until 2022. The Senate took no action. Throughout the summer, safety advocacy groups like Families for Safe Streets and Transportation Alternatives held numerous protest rallies in Bay Ridge, Park Slope and other Brooklyn neighborhoods to put pressure on Senate Republicans to reconvene and vote to extend the pilot program, thereby keeping the speed cameras operating. Families for Safe Streets is made up of parents of children killed by speeding drivers. One of the founders, Amy Cohen, lost her son, Samuel Eckstein, 12, in 2013. 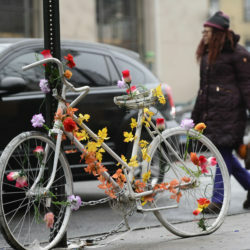 Samuel was struck and killed by a driver on Prospect Park West and Third Street. The fatal incident took place a month before his bar mitzvah. Golden was defeated in his re-election bid in November by newcomer Gounardes. In July, Cuomo came to the Sirico’s Caterers in Dyker Heights and spoke about the need for speed cameras. Cohen was among the members of Families for Safe Streets who met with the governor that day. But the Senate never reconvened, and the cameras remained inoperable until late August, when Cuomo worked out a plan with Mayor Bill de Blasio and City Council Speaker Corey Johnson and declared a state of emergency to reinstate the speed camera program on a temporary basis. “When your child dies, it is hard to be grateful. But today there is a little light amidst the darkness because Gov. Cuomo, Speaker Johnson and Mayor de Blasio have found a creative temporary solution to save lives,” Cohen said at the time. Speed cameras are designed to snap photos of the license plate of a speeding vehicle. The state then sends a summons in the mail to the vehicle’s owner. The cameras act as a deterrent to speeding because, according to transportation safety advocates, they hit drivers where it hurts: in the wallet.